and coats habitat. That makes it more difficult and invasive to the environment to remove. About 75 people attended a meeting Friday in The Dalles to discuss oil spill response along the Columbia River. Imagine a train derails along the Columbia River just south of the Oregon-Washington border east of Umatilla -- similar to what happened on Aug. 1, 2014, when five empty cars jumped the tracks and tumbled down into the water. Except this time, imagine the cars are tankers filled with 30,000 gallons of crude oil. And one of them is leaking. Officials with the U.S. Environmental Protection Agency, Oregon Department of Environmental Quality and Washington Department of Ecology joined Friday to break down what would happen if there was an oil spill in the Mid-Columbia, how emergency responders would contain the mess and strategies for preserving the region's most sensitive resources. About 75 people, including local government and tribal leaders, participated in the three-hour workshop at Columbia Gorge Community College in The Dalles. Presentations focused primarily on the different types of crude being shipped around the Pacific Northwest, as well as site-specific plans tailored to direct cleanup efforts on the ground. These Geographic Response Plans, or GRPs, are documents that basically serve as the initial marching orders in case of an oil spill on the Columbia River, providing detailed maps and prioritizing resources within the area. GRPs are in place up and down the Columbia River, with the Mid-Columbia plan now getting its first update since 2004. Sue Vezeau, lead planner with the Washington Department of Ecology, said that's due in part to an increase in crude-by-rail shipments through Oregon and Washington. Union Pacific Railroad reported a 19 percent increase in oil shipments nationwide in 2013, which included 3,278 carloads in Oregon. One of the railroad's main Oregon routes follows the Columbia River from lines that meet at Hinkle Yard near Hermiston. "Moving oil by rail wasn't a big issue even until 2012," Vezeau said. "We could potentially have a significant spill from that source." 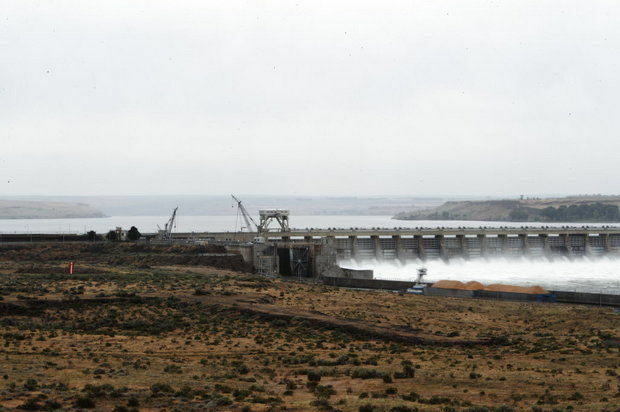 The Middle Columbia GRP spans 211 river miles, and is divided into sections behind each of the four federal hydro dams: Bonneville, The Dalles, John Day and McNary. The area behind John Day includes the stretches of river passing Boardman, Irrigon and Umatilla, while behind McNary includes Juniper Canyon and Hat Rock State Park. Both of these pools identify wildlife and endangered fish among their sensitive resources. The major dams also include a number of juvenile fish passage facilities that could become contaminated with oil if they are not closed in time. Josie Clark, Northwest contingency planner for the EPA, said these plans are what give the agencies their blueprint for working together, who to call and where to stage their equipment. But the plans only work if people understand them, which is why they scheduled the local work session. "I hope (people) got a better understanding of how oil spill response works in this area, and who the key players are," Clark said. Specific tools for cleaning an oil spill can change rapidly depending on what type of oil has been spilled. Mike Boykin, federal on-scene coordinator for EPA in Seattle, compared Bakken crude from North Dakota with tar sands oil from western Canada to illustrate the differences. Bakken crude, he said, is made up of lighter, albeit more volatile and toxic, components. It is highly poisonous but floats on top of water in a sheen, where it can be cornered with absorbent booms. Tar sands oil is thicker and more viscous, Boykin said. It is not as toxic, but sinks in water and coats habitat. That makes it more difficult and invasive to the environment to remove. "It's harder to get to oils that sink," Boykin said. "You have all those challenges of how do you dig it out." Don Pettit, emergency response planner for DEQ, said the goal is always to restore an area to pre-spill conditions. In order to achieve those conditions, they must look at both long-term impacts to the environment and net benefit of cleanup before moving forward. "Whatever cleanup action we take is going to have some impact," Pettit said. "We have to address those as we go." The public can view GRPs for the Columbia River by visiting the Washington Department of Ecology website at www.ecy.wa.gov. Public comments are being taken for the updated Mid-Columbia GRP until May 15. Comments can be sent to GRPs@ecy.wa.gov.